A search for “best food trucks in Barcelona” will return raving reviews for Indígenas Street Food. As one of the city’s few purveyors of Brazilian-Spanish cuisine, it didn’t take long for Asturian Bea and Brazilian Ricardo to build a large and loyal following. Three years later, having garnered enough experience and confidence, the couple opened a bricks ‘n’ mortar place and laid down roots of their own in the Sagrada Família area. 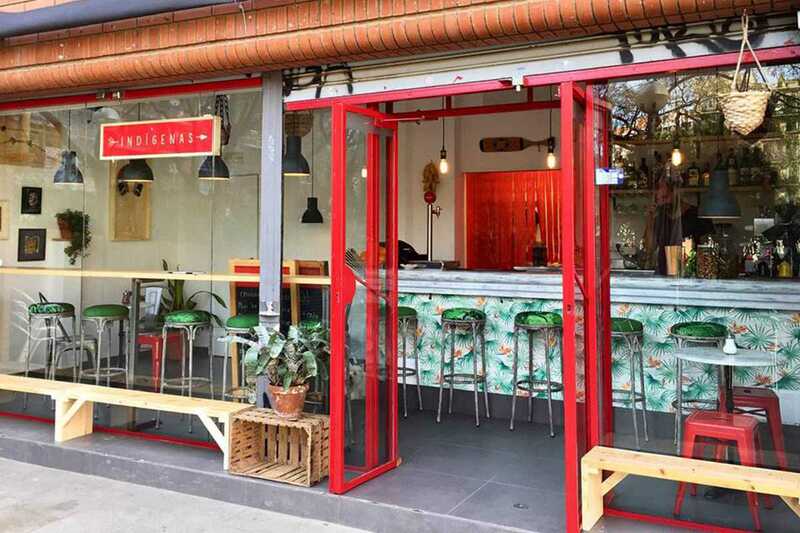 With its exotic red and sea-green color scheme and inviting patio area, they have maintained the fun, informal vibe of the food festivals where they honed their craft, and the menu continues to impress. The star attractions are the gluten-free tapiocas, a sort of crêpe made with yuca flour and lovingly adorned with fresh local ingredients – a Brazilian shell filled with Spanish soul. Stop by for brunch and hang around until dinner to sample the house craft beer, uplifting cocktails and authentic Asturian cider.